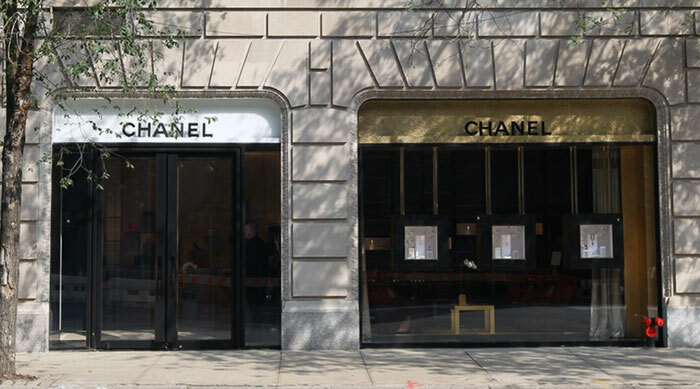 Residents of New York City's posh Upper East Side neighborhood are rethinking their lives after four thieves busted into the Chanel boutique located on Madison Avenue and bolted with 11 handbags worth $150,000. According to police, the men -- described as black, and range between 5'6" and 5'9" -- entered the boutique, which is teeming with security, around 1:15 p.m. Tuesday and snatched the purses, which range in price from $2,000 to $45,000. One of the items stolen was a large “2.55” alligator handbag worth $45,000. (This alligator bag was one of most expensive item in the store.) After grabbing the handbags, the thieves -- who were not armed -- pushed a security guard out of the way, ran outside and down the street before hopping into a four-door red sedan and driving away. Police sources say this wasn’t a typical “smash and grab,” as there was no damage done to the store during the grand larceny. One resident told the New York Post: "It is shocking, because they have so much security.” While another adds: “There’s a lot of brazen stuff that seems to be happening lately that hasn’t happened either before or in a long time. It’s kooky what’s going on. I’m a native New Yorker, so you definitely notice things. I mean, they have guards at the door — how’d they even get out of the door? I mean, there’s a homeless guy right here at the corner. For years, there was never anybody around asking for money. Now it’s everywhere you go.” So, homeless people aren't allowed on the Upper East Side? Update: The bag snatchers are not members of Mensa. Police say they have identified one of the thieves. How you ask? He rented the red Kia Optima in his own name. So it's only a matter of time before they're all arrested. Going back to the car, it was found abandoned with five of the handbags in the back seat. According to Chanel, its purses have nine-digit serial number stitched inside, which should give cops a better chance of identifying the bags if they surface online.